The “official” start of summer…around here that means traffic. People get out of the city and come here. I stayed home, having anticipated a stretch of time to garden and putter around the house. I’ve been sleeping deeply at night, probably because of the return to lots of physical exercise. When morning comes, waking involves getting upright and sitting with tea and journal. Out the window I can see my grampa’s bird houses on the neighbor’s pine tree. Just when I had given up hope of any birds using them this year, I saw the flash of blue. Yep, a pair of western bluebirds has taken up residence in the south house. Oh, joy! Things I wanted to do and did: batch of oat-n-wheat bread; tomatoes set out–Cherokee Purple, Tomaccio, Koralik, Siberian, Alaska Fancy, Gill’s All-Purpose, Silvery Fir Tree, Golden Nugget, Boxcar Willie (ten plants, what am I thinking? ); ten basil plants; ironed every damn pillowcase I own; trip to library; sniffed lilacs at every opportunity; excavated a big hole in the backyard, sifted the dirt, built a raised bed from reclaimed 2 X 6 lumber from my old deck, transplanted 21 strawberry plants; mend some work pants. Neighbors told me the junk man used to live here, and I have been astonished by some of the stuff I dig up. I’ve saved the forks and spoons and mixer beaters, along with springs and mysterious hardware and the plastic carousel horse. These are arranged in a spontaneous collage on top of a willow stump. Much more has been discarded–broken brown glass of Rainier beer bottles, mirror shards, rusted metal rods, car seat springs, telephone wires…I will plant flowers and blackberry vines. This afternoon I made a trip to Ellensburg and the going-home traffic heading west was already backed up for forty miles. 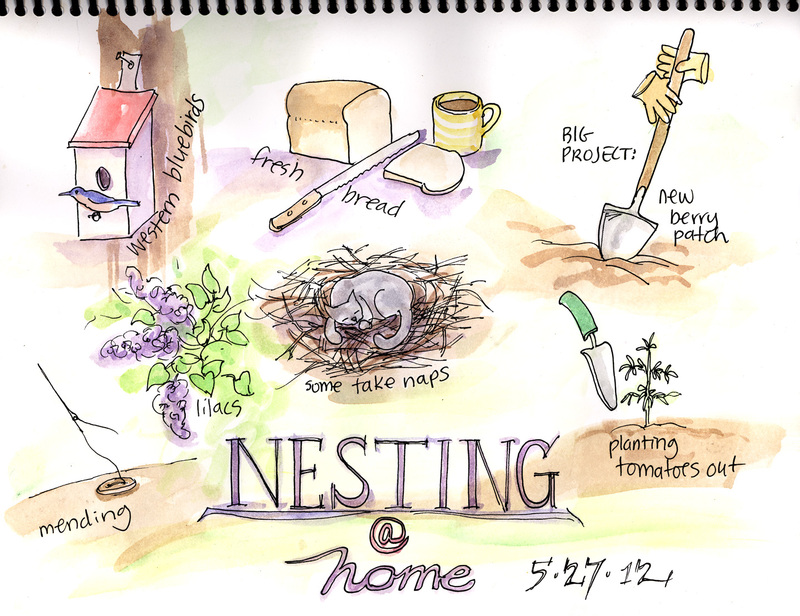 I took an alternate route, grateful to return to my nest. What an ambitious day! My Grampa bird house is empty this year – maybe I should have cleaned it out last fall! What are you going to do with all those tomatoes?? Sounds like lots of salsa to me!